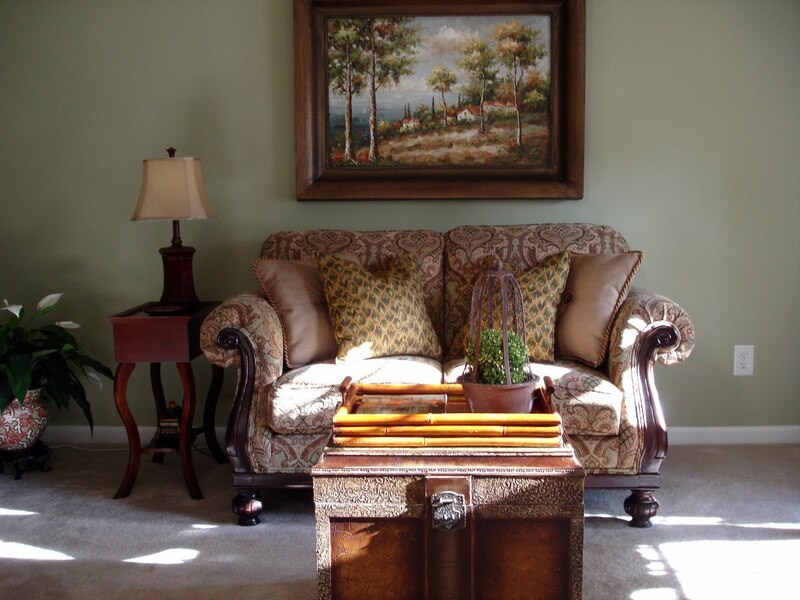 Our living room is located to the right of the foyer as you enter the front door. It isn’t an overly large room – roughly 12′ x 14′. 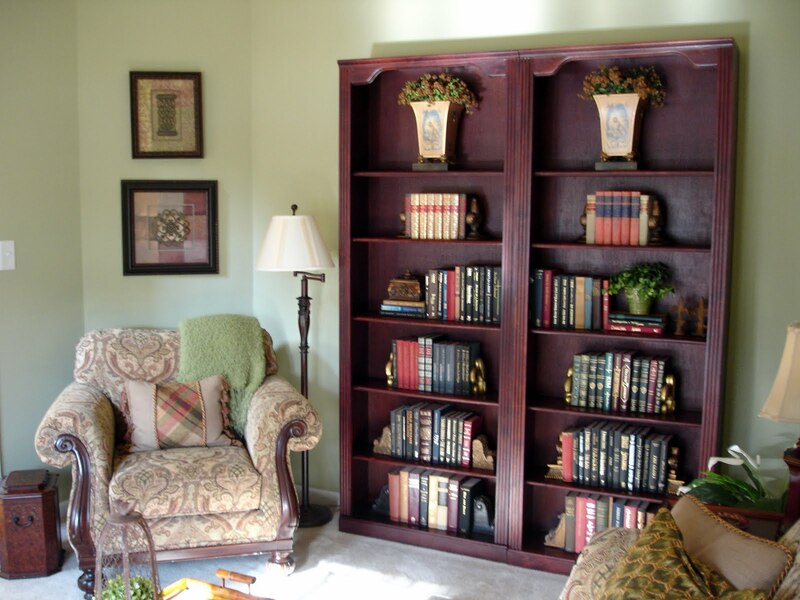 I used a pair of bookcases to create a focal point on the first wall that you see. Love the sunlight streaming in and the shadows that it creates. 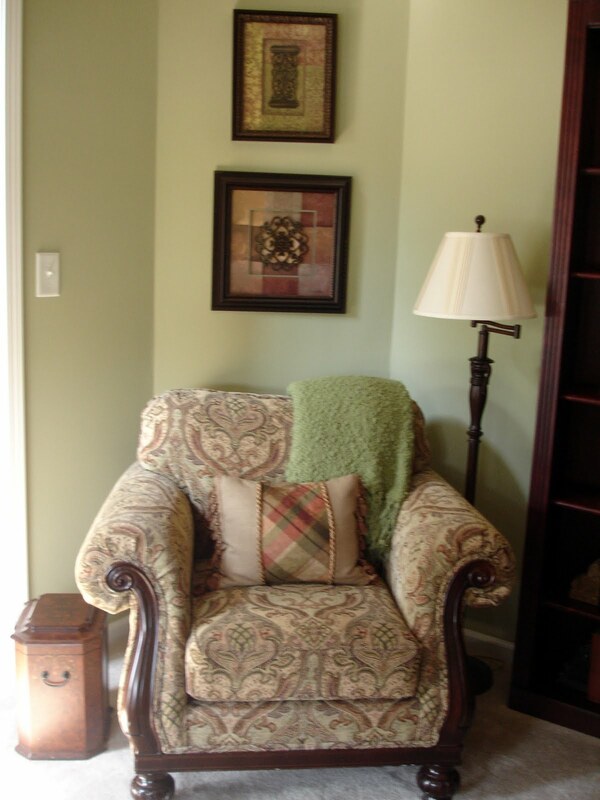 The loveseat is located on the wall directly opposite the entrance to the room. I just love this cloche with a chippy finish and a little birdie on top. 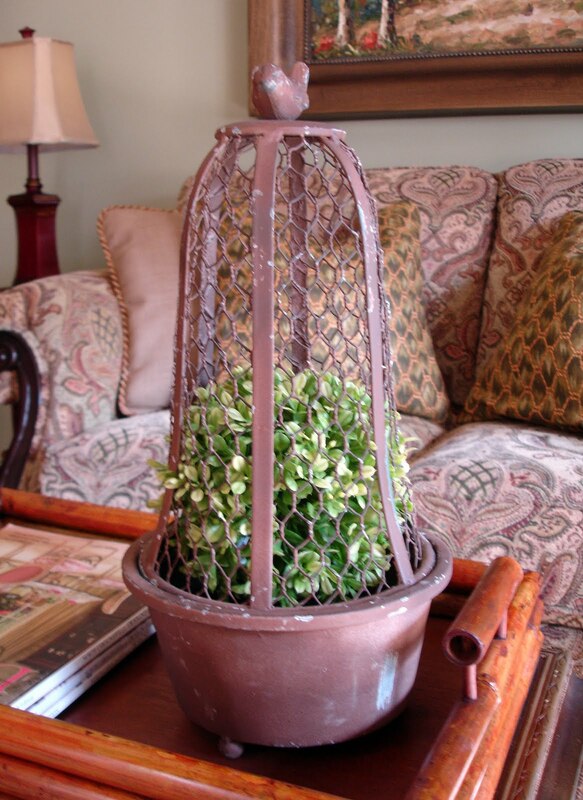 I just stuck a decorative ball covered with faux boxwood inside it. 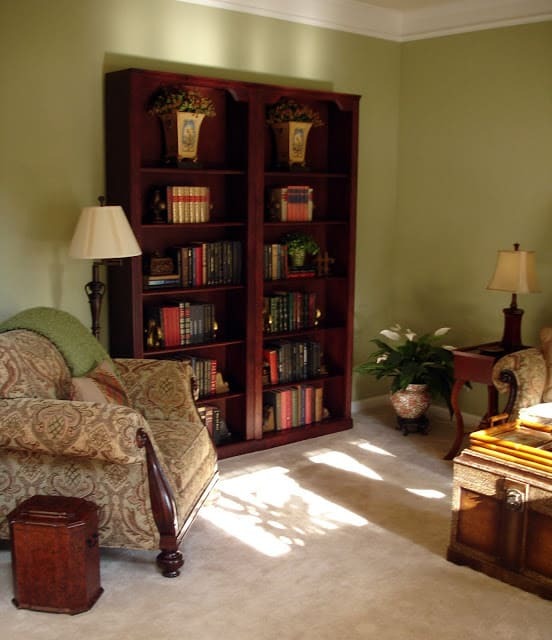 The bookcases and a chair are located to the left of the loveseat. I’d like to add a wreath to the front of the bookcase made out with either faux or fake boxwood one of these days. The wall behind the chair is on an angle and is a little difficult to work with. Hanging and couple of pictures and adding a floor lamp help to create a cozy nook. 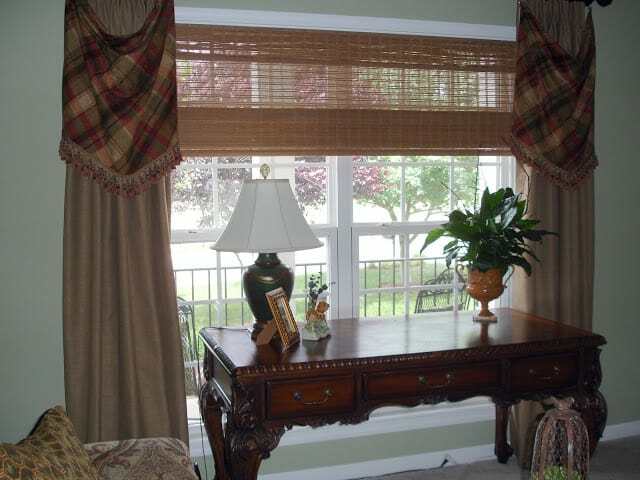 The double window that looks out into the front yard is flanked by skirted drapery panels that I made out of a burlap’ish fabric. I chose to go with woven wood blinds in here and in the dining room instead of the white wood slat blinds that are in the rest of the house. I love the look of woven wood blinds combined with drapery panels. The plant on this table is the only live one in the room. The rest of them are fake. I know a lot of you don’t like fake plants, but sometimes I like them in small doses. Here’s a closer look at one of the drapery panels. The sunlight streaming into the room makes the green on the walls look like a mint green, but they really aren’t. It is a richer, deeper Sherwin Williams color called Koi Pond. Thanks for stopping by! Hope you enjoyed this little tour. « House Tour – Come On In! The book shelf amazes me!!!! Wow! Oh, I enjoyed the tour. The dog looks like it’s very comfy in that living room! Haha! Its cute, though. On the other hand, the sunlight really affects the ambiance and colors of the room. It’s a nice factor to deal with in decorating and painting the house! Don’t forget to always know where the sunlight will strike the room, so that you can see the difference, as well. It’s good to play with natural lighting! Your living room is very pretty. I love how you arranged things in the bookcase and your books all match, mine look dreadful so we put them in the basement. 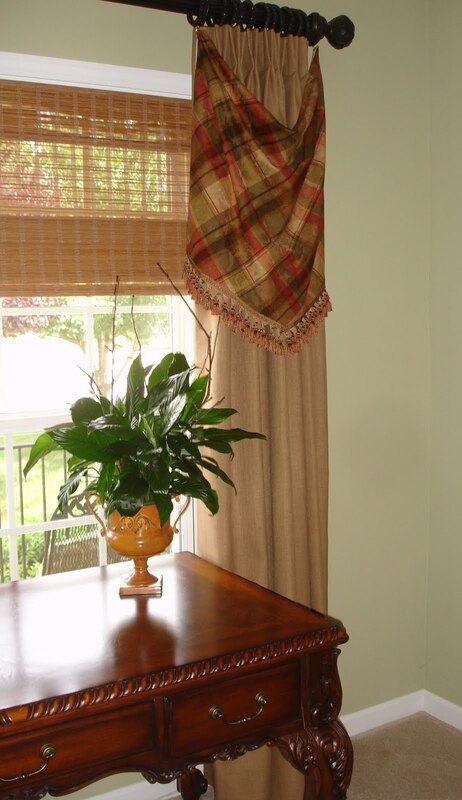 lol Your drapery panels are very nice too. Thanks for linking this to Home Sweet Home and have a great 4th weekend! @Cedrick Finly Thank you, Cedrick. I agree that it’s nice to have natural lighting to “play” with! @Sherry Thank you for your sweet remarks, Sherry. This was the very first linky party that I ever participated in. I love to decorate with books! @Pam Hi Pam. Thank you for becoming my newest follower! I love that cloche too and have been thinking about painting it. Everything in that room looks so brown to me. Have a blessed 4th! @marty (A Stroll Thru Life) Hi Marty. I’m so happy to have you follow my lil’ ol’ blog. Oh boy – a cloche party? I’ll be sure to link up! Hope you have a blessed 4th. I love it! I have a few fake plants too. What a great way to get books, I love used book stores. I’m your newest follower, I just have to see more of that fabulous puppy LOL! Your room is beautiful! I especially love the little cozy chair with the throw, pillow, and lamp. 🙂 I’d love to just curl up there with a book or fall asleep! Hi Suzy, I’ve enjoying visiting your living room. I love you sofa and the trunk the most. Everything looks lovely. I’m now a follower and hope you will follow me. Thanks! 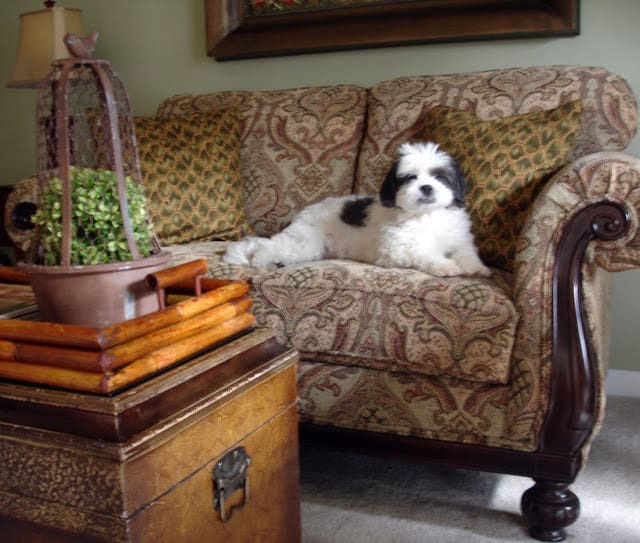 I just love the love seat and chair! I would so have those in my house. The set up in the room is very inviting and yes the sunshine adds to it. Of course your puppy is adorable. I came here from the newbie party. I’m your newest follower and I hope you will stop by mine for a visit. Beautiful decor! Love the natural light here. The love seat and chair are gorgeous! The puppy is so sooo adorable:) Thanks for sharing. Pretty room! Love the guard dog. 🙂 I have a love/hate relationship with fake plants too. Love that they are always green & don’t die but generally don’t like them – of course I have some though! Very elegant, yet cozy at the same time. Love your style! Gorgeous room and pretty colors. Very warm. Thanks so much for sharing with my newbie party. I hope to see you again. It’s lovely and charming! I’m partial to the birdie cloche myself! You’re extremely tidy!! lovely and cozy love it! The bird cloche is too great! Happy Independence day. Hugs! Aw, what a sweet room Suzy. I love your traditional style. I’m a new follower, here from Kim’s party. Hope you pop over for a visit sometime! What a lovely room! Well done! I loved the tour of your beautiful living room. Visiting from Transformation Thursday, and I am your newest follower. So pretty, it looks like a model home! LOVE the curves on that couch!